I’m having trouble letting go of summer. Labor Day has passed, so no more white pants or shoes, and I guess I should start thinking about autumn-ish foods, but with temperatures remaining in the 90s my mind is still geared towards grilling and cooking light foods. Chicken may be the main ingredient, but cilantro is the star in this grilled chicken entree. 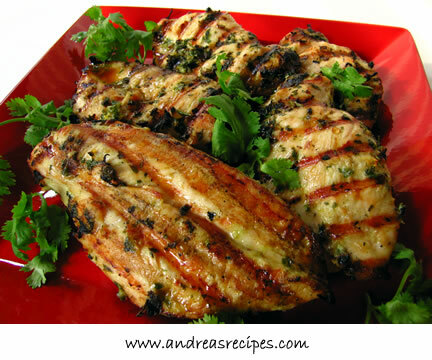 The marinade uses half a cup of chopped cilantro and more goes into the dipping sauce. The marinade and sauce are spicy, but you can control the heat by reducing or increasing the amount of jalapeños and red-pepper flakes. We like it spicy and I go for the full amount, but I did cut back when I made this for my parents last week. The chicken goes well with cabbage salad and a rice side, making this an easy meal. The recipe is adapted from a cookbook I added to my collection this summer, Food & Wine Magazine’s Quick From Scratch Herbs & Spices Cookbook. I have five of the books in this series, and they are regulars in my kitchen. The books are designed to give you great meals in a short amount of time, and both the books and the meals are easy on the budget, too. Technically, the recipe doesn’t mention a marinading time, you just coat the chicken and grill. Since we like intense flavors, we start marinading the chicken in the morning and then grill for dinner. The dipping sauce is very flavorful and we like it so much that we now double the recipe just to have enough of it. I also make it early and just let it sit out on the counter until dinner time. However, if you want to make this in 30 minutes, just skip the marinading time. I cook with herbs regularly, but somehow I always forget to include those posts in Weekend Herb Blogging (WHB), but this week I remembered! This is my contribution to a great event devoted to cooking with herbs, founded by Kalyn of Kalyn’s Kitchen. This week’s host is Katerina of Daily Unadventures in Cooking, so be sure to check out her blog for the round-up on September 16. 1. MARINADE THE CHICKEN: In the bowl of the food processor, add the jalapenos, cilantro stems and leave, smashed garlic, fish sauce, canola oil, sesame oil, and sea salt. Pulse a few times until the mixture is fully combined. 2. Put the chicken breasts into the plastic bag and pour in the marinade. Squeeze all the air out of the bag and mush the chicken around until all the pieces are coated in the marinade. Chill in the refrigerator until ready to grill, up to 8 hours. 3. MAKE THE DIPPING SAUCE: In the small sauce pan, simmer the rice-wine vinegar, sugar, and salt for about 2 minutes. Pour the mixture into another small bowl or glass measuring cup and set aside until cool. Stir in the minced red pepper flakes, minced garlic, chopped cilantro, and water. 4. Serve the chicken with the dipping sauce on the side. This sounds wonderful! I’m glad it’s still warm out so we can grill!! Andrea, this chicken sounds really good. i love the herby flavours you have created. This looks great and it’s getting warm here, so your blog is a good source of recipes for our coming Summer! This really got my attention. It looks just like a recipe I’d pick. I probably “need” to get this cookbook too! And welcome to WHB. Deborah, agreed! My grill is still fired up! Ahn, thanks! Cilantro is my favorite herb. Cris, thank you! Hope you enjoy the grilling recipes. That is a beauty! Cilantro is such a satisfying flavor and I’m enjoying experimenting with new recipes that showcase it. This looks great, thanks for joining WHB. Your presentation is gorgeous. Well I made this recipe tonight and it is just wonderful. I tried the chicken first and wondered why it needed the dipping sauce since the taste was just superb but then I added some sauce and wow! It was just another taste altogether. I’ll be making this one again for sure. Hey, this looks familiar… we made it last night! I’m liking how quick the recipes come together.